Synopsis: For most families, moving is a new beginning. But for the Creeds, it could be the beginning of the end. 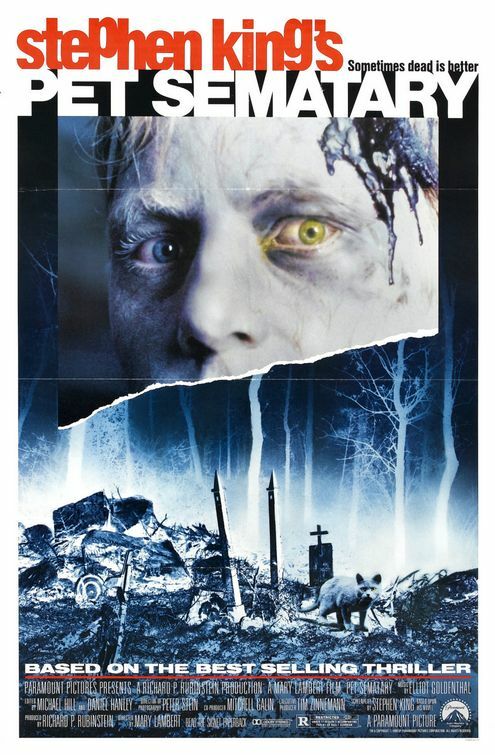 Review: When Pet Sematary was released to theaters in April of 1989, Hollywood had already worked its way through many of Stephen King’s earliest works. Carrie, Cujo, Christine, The Shining…these and more had found their way to the big screen and the attention was now turning to his more obscure works as well as the new novels he was continuing to publish. Largely, the results weren’t that impressive, resulting in some clunkers and a few passable entries in the anthology horror genre before a welcome detour into nostalgic drama with the now-classic Stand by Me. So going into opening weekend Pet Sematary wasn’t exactly a license to print money like some King adaptations would be several years after this one made nearly sixty million dollars at the box office. Yet the reason why Pet Sematary stands above many of the films that came before it and after (with a few notable exceptions) can be attributed to several factors. Unlike other novels that got the silver screen treatment, the source material was strong, the script from King himself was much more focused than anything the author had turned in before, and the direction from Mary Lambert was skilled at turning even the most benign situations into the stuff of nightmares. Moving from the big city of Chicago to the small town life in Ludlow, Maine, the Creed family is ready for a change. Louis (Dale Midkiff) is the new doctor at a local college while his wife Rachel (Denise Crosby, Unearthed & Untold: The Path to Pet Sematary) sets up home with their two young children (Blake Berdahl and Miko Hughes, Kindergarten Cop). Aside from being directly next to a busy road that sees semis frequently speeding past, it’s a welcome change of pace. They even have a friendly neighbor named Jud (Fred Gwynne) who has lived in the same house long enough to fill them in on all the town gossip…including what’s at the end of the path behind the Creed’s house. That’s where the pet sematary is…where the children of the town bury their dearly departed animals that either died of old age or met an untimely end thanks to the dangerous road right outside the Creed’s front door. Filled with headstones and gravemarkers that date back almost a century, there’s plenty to see here…but there’s also a place beyond the standard burial ground that holds a darker secret and it’s where Louis Creed will innocently cross a line that will lead to deadly consequences for his family. King has gone on record saying his 1983 book is the only one that truly scared him when he was writing it and there’s something to the simplicity of the set-up that makes you understand why. What King is detailing in the events of the movie are all of our wishes to bring our loved ones (human and animal) back but not understanding that often, dead is better. King also turns the tables on those that feel a sense of relief when the sickly do die…showing that they are haunted by memories long after the other person has been buried. Director Lambert has a rock and roll vibe to her movies but also perfectly captures the small town feel the movie requires. Largely taking place inside and around the Creed house, it’s a contained picture with only a few players and keeping it small makes the shocks more effective. It also shows some of the limitations to the actors with people like Crosby and especially Berdahl coming off as weak counterpoints to Midkiff and Hughes (who, at 3 gives a remarkable performance). Still, it’s Gwynne who walks away with the film with his Maine accent delivered in his basso profoundo voice. I also liked Brad Greenquist (Annabelle: Creation) as a mostly benign (if ghastly) ghost trying to guide the Creed family away from the evil they can’t seem to avoid. With a remake of Pet Sematary on the horizon, it’s nice to look back and remember how solid this first pass at King’s tale of terror is. Admittedly, it starts to get a bit histrionic in the last half hour with the dial being turned up on everything from Elliot Goldenthal’s music to Midkiff’s performance but when it plays it cool it’s highly effective. For an in-depth look at the making of Pet Sematary, check out Unearthed & Untold: The Path to Pet Sematary. It’s available on Amazon Prime!